In days long past (not fully aware of what I was doing, I must confess), I left everything behind in search of the eye of the dragon. At the beginning of my journey, I came across the teachings of don Juan, a Yaqui Indian shaman, through the books of Carlos Castaneda. Don Juan’s ancient Toltec wisdom was a beacon, but in the year 2001 I came across critical information, which proved conclusively that many of Castaneda’s claims were fraudulent. At the time, I had verified much of what he had written about, and the new and discrediting facts greatly puzzled me. They also forced me to question my findings and convictions, and to look in other directions to take new bearings. Furthermore, it had been claimed that Castaneda had left this world in full consciousness taking his body with him. And the turmoil that Castaneda’s ordinary death (due to cancer of the liver) caused in many of his closest followers, made me realize how blind human beings can be, and how ready we are to miss a point and become either judges or victims. I am writing these notes with a double purpose: To help me get a better perspective and a new direction, and to maybe help a few others do the same. 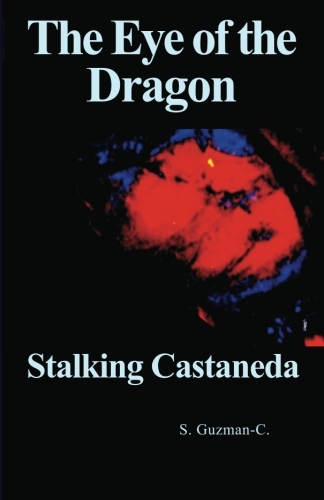 And in case you don’t know Castaneda, I’ll tell you a little about his work as I go along, for it was a great help in my search for the eye of the dragon. I will also juxtapose his work with other works that have also been helpful. I won’t delve into any of these works; that is unnecessary. I will just say that their main and recurring theme is our destructive egomania, and I’ll let my own experience illustrate. It behooves you to do your own research, and confirm the damaging effects of an unchecked ego, for being the bane of humanity its study is worthy of our consideration. Consider this: In an article I once came across in a monthly magazine, I read about a six-year-old boy who died after breaking his neck under an extremely heavy load, too heavy for the child to carry. The article also said that he had been a slave all his life. The author knew this because archeologists are trained to read bones. And the child’s bones, together with other bones (a mass grave for slaves), had been found while excavating somewhere in New York City (of all places) to lay the foundations for a new building. His bones not only told this archeologist how he had died but also how he had lived. They told him that he had been overworked all his life, that he had been malnourished, that he probably never had a loving arm around him. Those bones finally told the archeologist that that unbearable load had killed him at the tender age of six years old. Should I ever feel sorry for myself? But perhaps a more pertinent question would be, should I ever feel sorry for that little boy? For just like that little boy I am going to die, and although longer, my life might well end up being much more miserable than his was. For only by reducing my self-importance to the lowest, can I claim to be different from his captors and murderers; there is such a thing as collective responsibility, a social contract. We all endorse a social contract that thrives in egomania, an egomania that causes the suffering of humanity by rendering us blind to the Whole. The intent behind Castaneda’s shamanic books, is to help us become warriors who conquer ourselves; warriors who develop an awareness of our full potential as human beings. Apprentices are grouped as dreamers or stalkers, in an effort to classify them according to their abilities and energy configuration, but in fact, they have to be both; stalking helps dreaming and vice versa. Stalking is the art of developing a strategy to deal with the world as a spiritual warrior; dreaming is the art of controlling your dreams to develop your other self, the dreaming body. Stalking also helps when fixing the new position of the assemblage point while dreaming. According to Castaneda, dreams occur due to the movement of an assemblage point—the point where perception is assembled. This point (located at arm’s length behind us, between the shoulder blades) supposedly moves naturally while we sleep, changing our perception. If we volitionally hold that new position while we dream we are also stalking that dream and doing dreaming—the same thing we unwittingly do with this dream called life. Some call this process of controlling a dream lucid dreaming. I could hear the branches overhanging my porch, rustling in the cool summer breeze. My neighbors were away that night, and not a sound came from their apartment. I lay on my back, closed my eyes, and, after overcoming the barrage of meaningless random thoughts, my mind drifted into silence. Keeping my eyes closed, I looked for the color orange. Soon an orange circle appeared; it expanded into nothing, appearing again to expand once more and once more and once more . . . Suddenly, a scene appeared! In front of me I was seeing a building and a road; the long brick building had an architectural design that I had never seen before. I was sure that the vision would soon vanish due to my inability to hold it, as was usually the case. But to my surprise, the scene stayed. I decided to hold it for as long as I could in an effort to train (using Castaneda’s terminology) my dreaming attention. Soon, it startled me to realize that the building and the rutted dirt road in front of me were staying. I also understood that I could enter another world through that vision, a world perhaps as real as my day-to-day reality. As soon as the realization struck me, I felt myself being pulled into the vision. I (or my dreaming body) was no longer lying on my cot, but standing inside the covered bed of a two-and-a-half ton truck. I climbed down while disentangling my pants, which had stuck somewhere—probably a trick of my mind to distract me, since our reason will always feel threatened when unable to explain an event. I surveyed my surroundings. It was obvious that I was not in the United States. I was nowhere that I could recognize. I meandered down the dirt road trying to figure out where I was. It seemed hot, maybe tropical. I saw a group of teenagers, stripped to the waist, tobogganing down the slope of a dirt hill on pieces of cardboard. I approached them. After thanking them, I continued my stroll. I wanted to verify that my dreaming experience was really taking place in Morocco; it is seldom that I can verify where I have been when dreaming. The places that I visit seem to be usually phantom worlds of my own making. It was a bright, sunny day. It seemed that I was close to the ocean, but I couldn’t see it. I did see some black men dressed in white tunics, wearing yarmulkes. I strolled uphill toward the park, where they were chatting around a long wooden bench sans a backrest. As I approached them, I surveyed my surroundings again. The park ahead had grass that seemed to have been recently mowed. I don’t remember any trees, although I saw long winding walkways and extensive terrain. I stopped briefly and looked back to make sure that I could retrace my steps to the truck, as if there was an entrance there to my everyday world. But I didn’t need an entrance; shortly after I continued my stroll, I found myself back in my apartment. I was baffled. Never before had I entered the dreaming attention but in sleep. This was a new and unexpected development. I figured that I had gone somewhere, Morocco? And it had happened while I was awake; I had entered that vision, that somewhere, awake! Next morning, I looked for Morocco in the World Wide Web, and there they were—the long brick buildings! And people were wearing long white tunics and yarmulkes. I couldn’t be certain, of course, maybe the place I visited wasn’t Morocco. But that was irrelevant. The relevant new development was that I had entered that world, with my dreaming body, while fully awake. That meant to me that by merely stilling my mind, I had been able to hold a vision (stalk it) and enter dreaming with my other self. Hitherto, I had always entered dreaming by looking at my hands while having a common dream. According to Castaneda, the volitional act of looking at your hands (or whatever) gives you control of the dream; and from then on it becomes dreaming, a controlled experience as linear and real as your everyday life but without the physical body, so nothing limits your movements. Dreaming is a door to the second attention; it is also a way to the third attention, to Infinity. The dreaming body becomes the other. The dreaming experience mentioned before was indeed a new development for me, and it opened doors that I didn’t know existed; it gave me a new perspective. This happened for the first time some fifteen years ago. Since then, however, new findings have altered that new perspective. I have come to realize that dreaming, or any other psychic power that we may develop, don’t have much to do with awakening; in fact, it could be a help but also a hindrance. This dream is for us to enjoy. The path to inner knowledge seems to be a difficult winding road because of our own mindset. To follow that path has been compared by ancient sages to walking the edge of a razor, because of our destructive self-absorption, which clouds our vision and turns our dream into a nightmare, or into sheer hell. In truth, everything is handed to us. Or, to paraphrase the Christ, although we do not see it, the kingdom of heaven is spread out upon the earth. The amazing amazon kindle 2; the next generation ! You say that the habit of self reflection is harmful, please elaborate. Self-reflection is the internal dialogue. The wandering mind. The ego constant preocupation with itself. I had noticed that I’ve been getting lost in moments though, I’m not sure whether I’m “doing” or “being”, I like to go with the flow and I subconsciously try to plant seeds of wisdom in others with sly tactics. What are your thoughts on getting lost in the moment? (example: Playing guitar and jamming with my friends and getting lost in the music, but feeling happy because of the creativity, the productivity, the sheer feeling of participation in something just like the feeling of a simple game of catch or frisbee.) Is it not being fully aware of now or is it simply being/going with the flow? If you are immersed in what you are doing you are living the moment. Your full attention is in what you are doing. Is that what you mean? Yes that’s what I mean, fully immersed in whatever I’m doing. There are subconscious thoughts sometimes diverting me away from the moment, and I do get distracted a little. For some reason I feel some sort of guilt in me when I get lost in playing music or in a good conversation. I’m confused because I’m not quite sure how being fully immersed in whatever you’re doing can make you fully aware. Presence of mind, does that have to do with not calling your parents to let them know you’;re safe because you’ve left all of your worries and stresses behind? But let’s say I’m no the bus or lying in bed. Sometimes I get lost in my imagination and create things/stories/adventures in my mind. But it feels rewarding to me to stop and reflect on my day or on a trouble I’m having. I don’t want to live from moment to moment never accomplishing anything. It feels like that’s what this full attention business is. Feeling guilty in this case is a thing of the ego; just do your best. Be aware of what the mind is doing–meditation (presence) should be fun; make it play. Your confusion will clear as you practice. The past can be used sometimes for reference or to figure out something; the problem is daydreaming–the mind running away with you. Your parents will, of course, worry about your welfare so it is always good to let them know how you are doing. Every think of going back to Arcosanti? I am having thoughts of going back, I love the feelings of the rocks, the desert, I know its not perfect there, but it’s special place for me. Your thoughts please. Hi Louis! Thanks for writing! I loved Arcosanti. And I might stop for a visit sometime. Change is permanent after all; and who knows, they may be changing for the better. We have to make allowance for that. You will not know until you go. Take care, good luck and keep in touch. Good Info. Tweeted about it. I’ll bookmark this post too. I would like to say thanks for the time you took in writing this post. This has been enlightening for me. I have passed this on to one of my friends. For creativity you need your mind to wander, but you additionally want to be able to discover that you just’re thoughts wandering and catch the concept when you have got it. Hi Ann! Is Marlo a pen name? Watch your wandering mind carefully to discover when it leads you to creativity, and when it is just running away with you. I couldn’t find out who Gustavo is, but I liked the three quetions. Castaneda was my guru, great post! Awesome! So what do you think? Is there anyway to buy the book in Mexico. What I mean like a store or somewhere where I can buy it directly Thanks for the help!